In a field where so many saxophonists opt for the smoother sound, it’s always a good day when an artist plays the instrument with an edge, an old-school verve. 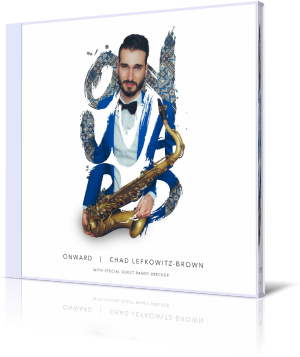 Chad Lefkowitz-Brown comes through with Onward (2017). Lefkowitz-Brown plays the tenor sax. His accompanists are Steven Fiefke on piano; Raviv Markovitz on bass; and Jimmy MacBride on drums. Special guest Randy Brecker plays trumpet on a couple of tracks. The title song opens the set in dramatic fashion. This hard-charging, free-spirited piece is like a call to move forward. Upbeat, with solid play from all, it’s a song that can get you on your feet, or that you can enjoy just listening. Lefkowitz-Brown leads most of the way, but there’s not a moment when you don’t feel the others. Fiefke also has a stunning middle solo. Brecker sits in on “Franklin Street” and “Blues for Randy.” The former is a cool, moderately paced song that allows for plenty of interaction between tenor and trumpet, with lots of grooves laid down by the bass, piano and drums. The latter is a funkier piece that’s played with a lot of sass. Lefkowitz-Brown, 27, has toured with pop superstar Taylor Swift, and jazz greats such as Dave Brubeck and Arturo O’Farill’s Afro-Latin Jazz Orchestra. One challenge for jazz artists, or any instrumentalist, is to attract young audiences. If it’s not catchy or has someone singing or rapping, many of today’s youth lack the patience. Lefkowitz-Brown cuts through that barrier through the use of social media. His presence on Instagram, Facebook and YouTube has made some inroads to the millennial general. Though he has earned comparisons to Randy Brecker’s deceased brother, Michael, Lefkowitz-Brown on this date also conjures impressions of Sonny Rollins and other legends of that era. Lefkowitz-Brown composed five of the nine tracks. The rest are covers of songs by Stevie Wonder, Hoagy Carmichael, John Coltrane and Cole Porter.